Ignore the Hallmark cards and Hollywood films, the binary relationships between boy and girl. If Valentine’s Day is all about love, then this is our timely reminder: it takes all kinds of love to make the world go ‘round. The internet is lousy with stories of cross-species love – monkeys who love dogs, lions who love dogs, gorillas who love teeny tiny birds – but Roo and Penny Chicken are the Tim Burton and Helena Bonham Carter of the animal kingdom: weird in isolation, perfect together. 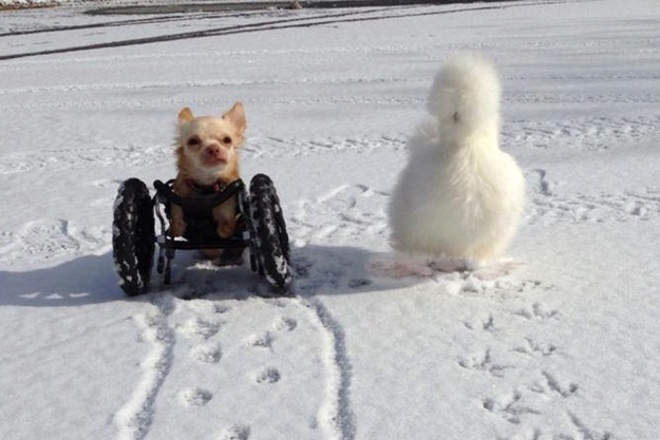 Roo the Chihuahua is disabled, motoring around on a makeshift two-wheeler when he’s not walking around on his mighty hind legs. 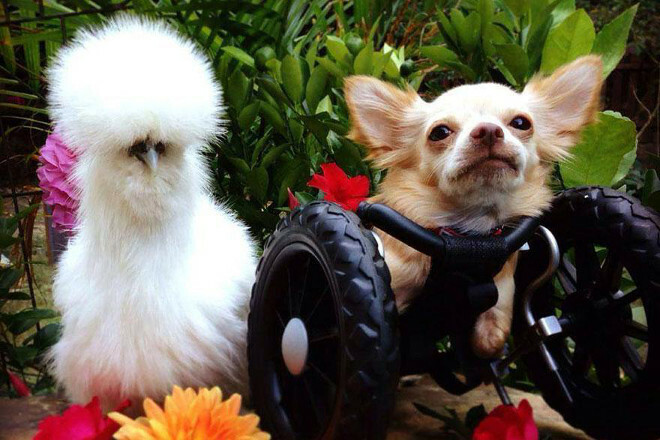 His best friend is Penny, a Silkie chicken with a powderpuff for a face who was saved from a laboratory. A two-legged dog and a fluff ball on sticks, best friends forever. Ain’t that just beautiful? A former US air force cadet and world champion archer, Erika Eiffel, rose to fame in 2007 when she married the Eiffel Tower. Erika is a self-confessed objectophiliac – a person who experiences sexual and/or romantic feelings towards inanimate objects – and was previously involved with her competition bow, which she calls ‘Lance’. With Eija-Riita Berliner-Mauers (who is married to the Berlin Wall), Erika founded OS International, a support group for people who identify as objectum-sexual. “There is a huge problem with being in love with a public object,” Erika says. “The issue of intimacy – or rather lack of it – is forever present.” Possibly there are also some other issues as well…but live and let live, we say. 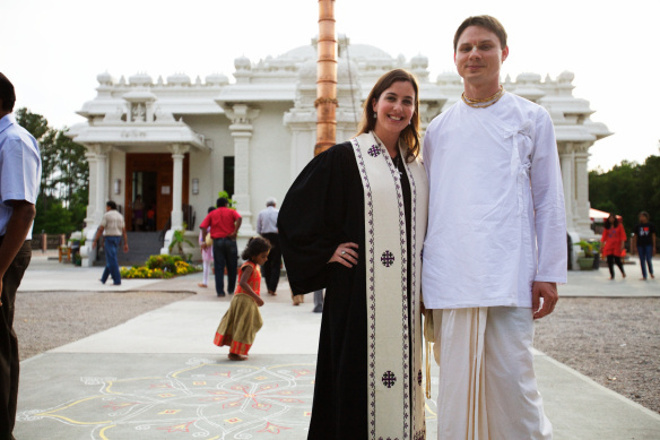 Dana Trent, a Baptist preacher, found the love of her life in Fred Eaker, a devout Hindu and former monk. Fred was pre-selected for Dana on an Internet dating website because of their shared values, despite the fact that their spiritual beliefs are totally contradictory. This interfaith power couple made it work by erecting a home altar that includes pictures of Fred’s swami, two Gaura-Nitai deities and an icon of Jesus Christ; they make daily food offerings and then Dana gets down on her knees to talk to the big guy in heaven. Love trumps religious dogma in this beautiful modern day romance, recounted in Dana’s book, Saffron Cross. In 2009, a Japanese man who goes by the name of SAL9000 married a Nintendo DS character. The blushing bride was Nene Anegasaki, an anime dream girl from the dating sim game Love Plus, the last in a string of digital girlfriends for SAL9000. The ceremony took place at a Tokyo tech meet-up and was simulcast around the web, with a real live priest performing the marriage rites and a slide show of SAL and Nene’s most tender virtual moments. 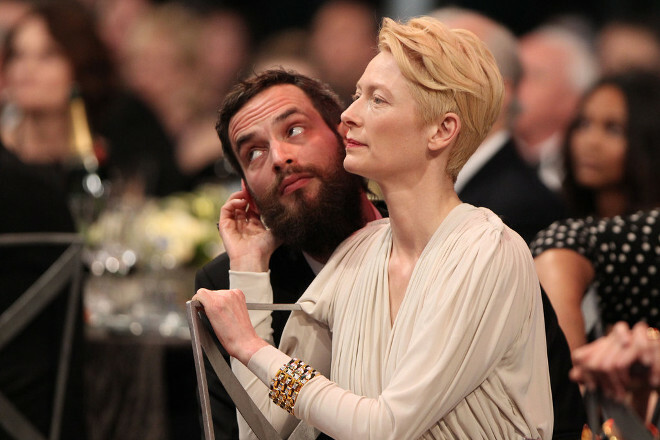 For a long period in the late-noughties, Tilda Swinton would appear at award ceremonies and public events with Sandro Kopp on her arm. Eighteen years her junior, the German-born artist was something of a toy boy, but still deeply loved. After they’d been out on the town, Tilda and Sandro would head back to Nairn in Scotland where Tilda’s husband John Byrne and their twin boys were waiting, and all three adults would play house together. John Byrne has reportedly moved out, so Tilda’s polyamorous relationship is now past tense, but it remains completely fascinating, wonderful and strange. Chang and Eng Bunker were Chinese American plantation owners and history’s most famous pair of conjoined twins. Joined at the sternum and sharing a liver, Chang and Eng would be separated easily today, but in the mid-19th century they were stuck together for life. Luckily, they found a sympathetic pair of sisters, Adelaide and Sarah Anne Yates, who each married a Bunker and bore many Bunker children. Sadly, the women didn’t get along, so two nearby households were set up and Chang and Eng alternated between their two family homes. Allison Glock with T Cooper. T Cooper is an American novelist, author of Lipshitz Six and Some of the Parts. He and his wife, non-fiction writer Allison Glock, met when they were both asked to contribute a playlist of their favourite songs to the New York Times. Allison saw a bi-line picture of T and was instantly smitten, reaching out to him via email to begin a beautiful, non-stop courtship. One of the many things T shared with Allison as their relationship blossomed was that he had been born a woman. 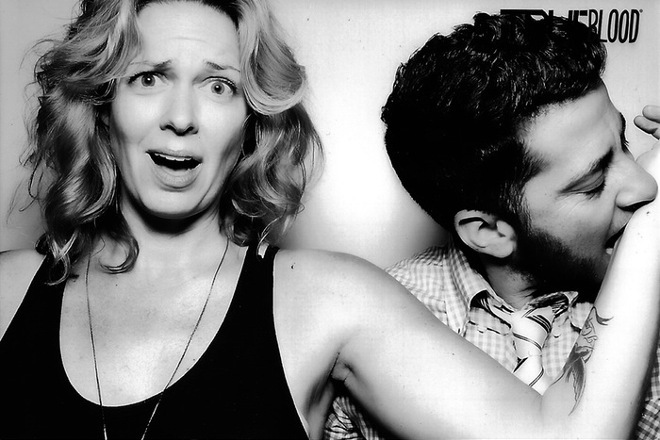 Allison had never dated a transgender person before, but it didn’t matter. She married T just over a year after they met, knowing without a doubt that he was the man of her dreams.